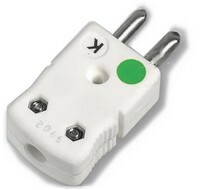 Two pin standard size connector with round pins plugs for various thermocouple types in IEC colours. The terminals and contacts are made from material suitable for the thermocouple type. Appearance may vary from image shown. 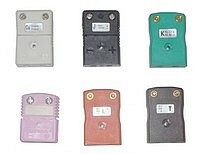 Two pin standard size connector with round pins sockets for various thermocouple types in IEC colours. The terminals and contacts are made from material suitable for the thermocouple type. Two pin standard size connector with round pins plugs with a glass filled thermosetting body to withstand high temperatures. 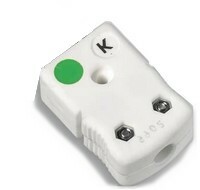 The thermocouple type is denoted by the IEC colour code dot. Two pin standard size connector with round pins plugs with a ceramic body to withstand high temperatures. Two pin standard size sockets with a ceramic body to withstand high temperatures. These are specially made for TMS Europe. 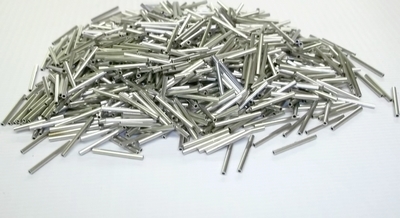 Nickel plated copper tube which is used to crimp on the end of platinum wire in the thermocouple industry.